Alehousewells School held a sponsored walk last week. On Wednesday, March 27 each pupil at the school and children in the nursery classes were challenged to walk around the perimeter of the school ground and to complete as many laps as possible. Before the event the perimeter of the grounds was calculated as being 500 meters. 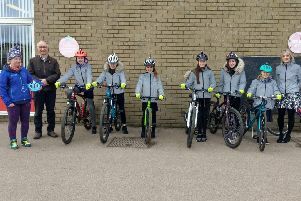 Teacher Michelle Morrison said: “The children enjoyed the challenge with a total of 1,610 laps completed, which works out at over 800 kilometres walked. “The money raised will be used to buy new gym equipment with an estimated final total nearing £2,000.